M Tech Innovations Ltd., an ISO 9001 certified company addresses all customer requirements and meets the increasing demands of the customers with the latest technology. The production of membrane keypads and panels commenced in 1993 and established M Tech Innovations Ltd. as a preferred supplier all over India. 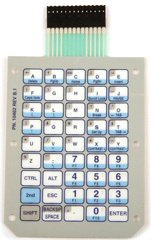 The membrane keypads in India were initially developed to meet the industry requirement for inexpensive custom switches with flexible and low profile characteristics. The central control panels of membrane keypads India basically have feather touch control membrane switches or keyboards. Our membrane keypads are preferred by many organizations in India for being the most reliable. We provide membrane keypads all over India with a full spectrum of eye catching colours. You can get them customised as per your exclusive requirements. M Tech Innovations Ltd. adheres to strict ISO procedures in the development process offering excellent quality membrane keypads. The operating principle of M-Tech is adding value, consistent improvement which results in offering more than the customer expectations in terms of timely delivery and quality.